One of the most common deer tattoo designs is the tribal deer tattoo which traces its origins in Celtic and Native American arts. These designs are much valued because of their symbolic value, in attachment to their unmatched glamor and grace. As said previously, the doe is used as a symbol of tender love, softness, and kindness in a tribal art form, while a stag stands for power and virility. 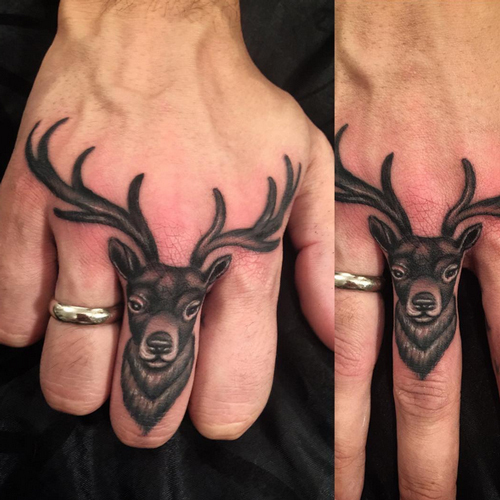 Fascinating tattoo bearers should opt for scenic deer tattoo designs, which may describe a nice looking deer in the lead and a striking picture in the background. An artist can create a fascinating story with such designs besides creating an eye-catching essence for anybody. It would make the heads turn towards the bearer. Another skull tattoo design which is quite common to be seen in men and women is the deer skull tattoo, finished with the face and antlers of the deer. You can usually spot it on the shoulders of men as it represents power and masculinity, although women have also started choosing this tattoo form. In Celtic culture, deer is associated with Cernunnos, the idol of lust and richness. He is portrayed wearing deer antlers and as such the antlers have come up as a symbol of male energy and fertility. 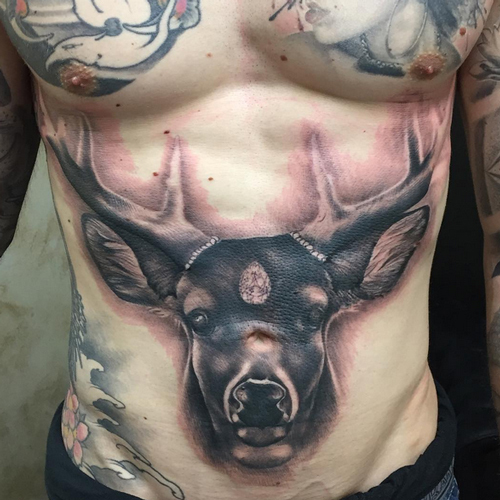 Here is what accounts for the popularity of deer skull tattoos among men. Deer have been admired as animals of beauty and elegance, with their flexible movements attracting the human race to chase and catch them. At the same time, this beautiful animal is associated with some symbolic qualities too, like a female deer or doe is viewed as an epitome of gentle love, kindness, and tenderness. On the other hand, a stag or male deer denotes fertility, masculinity, and sexual prowess. In the general sense, the deer tattoo relates with the metaphorical meanings of majesty, peace, love and kindness. Some also regard it as a symbol of rebirth and transformation while others take it as an epitome of beauty.